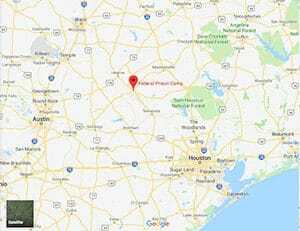 Location: FPC Bryan is located 95 miles northwest of Houston and 165 miles south of Dallas, in the town of Bryan at the intersection of Ursuline Avenue and 23rd Street. Background: FPC Bryan was opened in 1989. Notable inmates include former Commissioner in Hidalgo County, Texas, Sylvia Handy, (sentenced for hiring illegal aliens as county employees, personal caretakers, and stealing their earnings to pay for personal expenses), and Ruby Jane McMillan (convicted for conspiracy as part of a methamphetamine distribution ring). Housing: Inmates are housed in both open dormitories and rooms which house four to ten inmates each. Health Services: Health services provided at FPC Bryan include, sick call, emergency health treatment, medications, contact lenses, physical examinations, chronic care, HIV testing, dental services and an initial screening. Emergency medical care is available 24 hours a day. Routine care is obtained by submission of a sick call form. Psychology Services: FPC Bryan provides screening, assessment, and treatment of mental health and drug abuse problems, individual and group counseling, psycho-educational classes, self-help and supportive services, and referral to Health Services for medical treatment of a mental illness. Comprehensive assessments of inmate’s strengths and weaknesses are made, along with programming recommendations specific to meet psychological needs. Brief counseling and long-term therapy, as determined by the psychologist, is available. Medication monitoring and evaluation for medication referral are available. Mental health programs are designed to help inmates with severe emotional, cognitive, and behavioral problems are available for inmates who are having difficulty functioning in a mainline institution due to a psychological disorder. The STAGES Program for inmates with serious mental illness and personality disorders is also offered. Residential Drug Abuse Program (RDAP): FPC Bryan houses a Residential Drug Abuse Program (RDAP). It also provides a drug abuse program, Drug Abuse Education Course, and the Non-Residential Drug Abuse Program (NR-DAP). Education Services: FPC Bryan provides literacy, GED, English-as-a-Second Language (ESL), Adult Continuing Education (ACE) courses, and parenting classes. Incentive awards are provided to inmates making satisfactory progress and successfully completing the literacy programs. Inmates may also receive incentives for progressing to various levels in the GED or ESL programs. Graduation ceremonies recognize GED, ESL, and Occupational Education completions. High school diplomas and post-secondary programs are available through paid correspondence programs. Advanced Occupational Education: FPC Bryan offers advanced occupational education in Accounting Technology, Administrative Assistant Specialist, Cosmetologist, HVAC, Horticulture, Medical Transcription and Coding Specialist, Microsoft-Business Applications, and Small Business Management. Vocational Training: FPC Bryan does not offer vocational training programs aside from the advanced occupational education programs. Apprenticeship: No apprenticeship training programs are currently available at FPC Bryan aside from the advanced occupational education programs. Library Services: FPC Bryan offers both leisure and law libraries. The leisure libraries offer inmates a variety of reading materials, including periodicals, newspapers, fiction, nonfiction, and reference books. An interlibrary loan program with local, state, and college libraries and available bookmobile services is also available. The TRULINCS Electronic Law Libraries provide inmates with access to legal materials and an opportunity to prepare legal documents. A copy machine and electric typewriters are also available for inmate usage. UNICOR: The FPC Bryan UNICOR faculty handles services. Commissary: Inmates are allowed to spend $360.00 monthly in the commissary on their assigned shopping days. Inmates may use funds in their account to purchase items at the institution commissary, place funds on their inmate phone account, purchase TRU-Units for their TRULINCS account, or send funds in another manner. Often inmates carry their purchases in laundry bags back to their housing unit. Recreation Services: Leisure activities at FPC Bryan include organized and informal games, sports, physical fitness, table games, hobby crafts, music programs, intramural activities, social and cultural organizations, and movies. Art and hobbycraft programs, wellness programs and other recreation programs are also available.